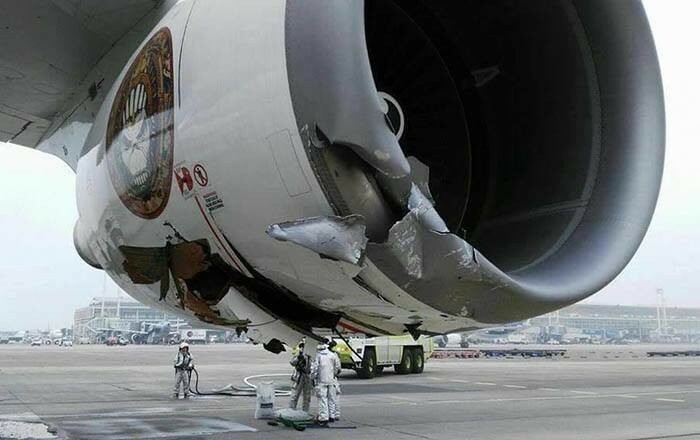 Iron Maiden’s 747 Ed Force One’s engines were badly damaged in a ground runway accident at a Santiago, Chile airport. No band members or Maiden crew were injured; the two ingured were local Chilean ground tug operators, who are now reported to be making a full recovery. British troopers and consumate showmen that they are, EF1’s damages will not stop the Maiden tour juggernaut, all tour dates remain on schedule as Maiden use replacement aircraft whilst EF1 is in the shop for repairs. Ed Force One was this morning tethered to a tow truck to be taken for refuelling prior to flying over the Andes to Cordoba for the next show. On moving the steering pin that is part of the mechanism that connects the ground tug to the aircraft seemingly fell out. On making a turn the aircraft had no steering and collided with the ground tug badly damaging the undercarriage, two of the aircrafts engines and injuring two ground tug operators, both of whom have been taken to hospital. We hope of course that they make a full and speedy recovery and we will be closely monitoring their progress. 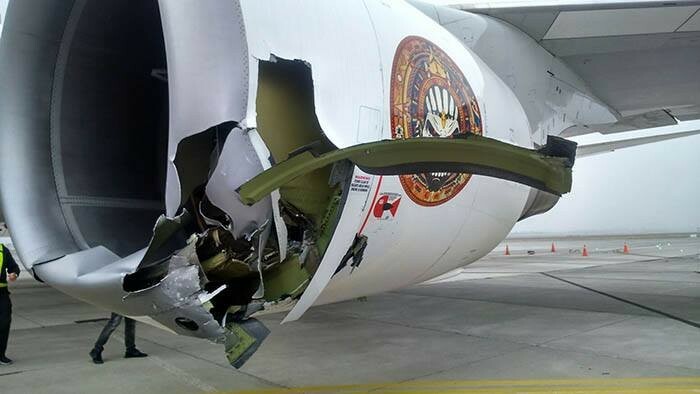 The flight engineers are on site and evaluating the damage, but their initial report is that the engines have suffered large damage and will require an extended period of maintenance and possibly two new engines. We are happy to tell our fans in Cordoba that our Killer Krew has sorted out all logistics for us to be there with our full show for you all tomorrow. We expect no disruption to the tour in any way and are looking for a replacement 747 Ed Force One while our current beauty is healed. More news on that later. Until then, believe me, we will get to you all on this tour one way or another wherever you are. We are also delighted to say that we have been officially informed that the two Chilean airport staff who were injured following the malfunction of the tow truck connecting bolt will make a complete recovery. Best wishes to them and their families. Up the Irons! See you soon. And thanks Chile, what an amazing reaction and show! !